I had not drawn a cartoon for The Seattle Times since May so it felt good to get back to work with them. This is in today’s edition. I’ll also have another cartoon on their pages tomorrow. The Pronto issue is interesting. 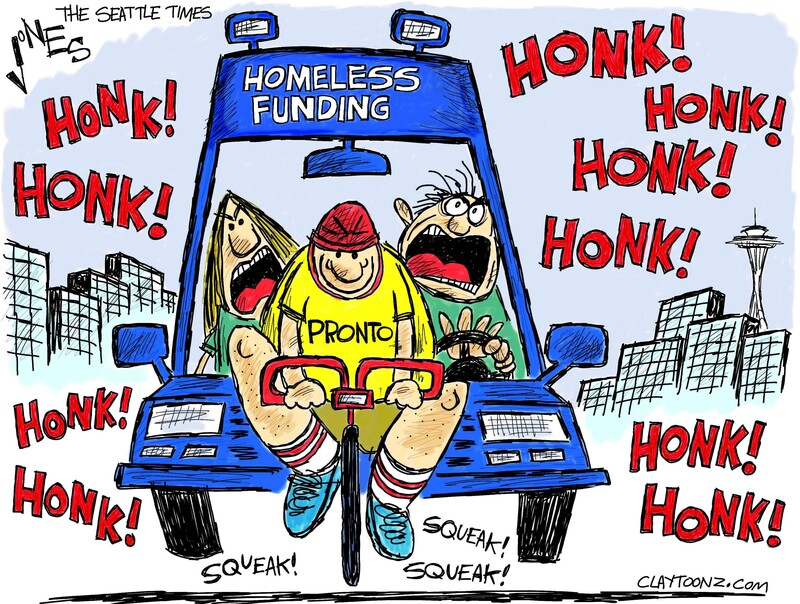 The city is spending mega bucks on a bicycle system while scrapping for funds to handle their homeless situation. Read the Times’ editorial. This was the third idea on this issue. A variation of the first idea was approved. I was going to draw it the next morning and while getting a haircut I thought of this idea which I liked so much better. Thankfully so did my editor. I believe it’s the first time I put the Space Needle in a cartoon for them. I was avoiding it for a while as I didn’t want to go all cliche on them and give the impression everything I know about Seattle I learned from watching Frasier.